In my last blog post, I discussed the use of coral skeletons as bone grafts in patients with degenerative bone diseases. However, most of the medical advances from coral is in the field of pharmacology, that is, the study of drug interactions and effects on the human body. Cooper et al. 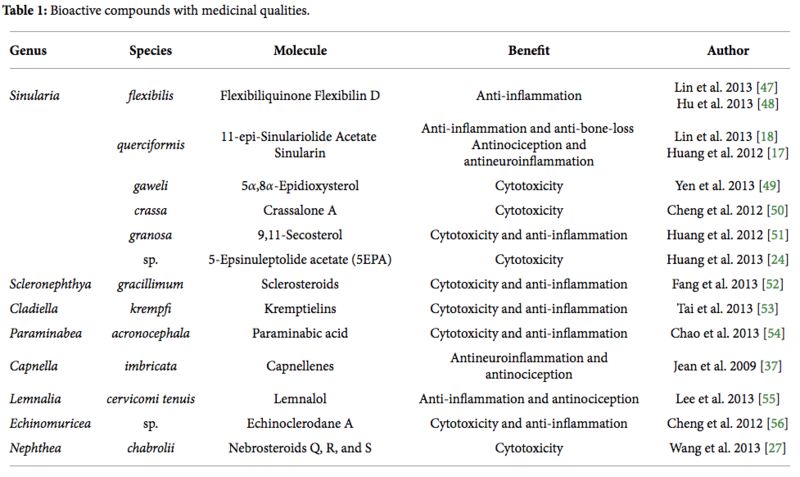 (2014) include a comprehensive table of many coral derived chemicals that have been found to benefit humans (Figure 1).¹ As you can see, these compounds have a wide variety of medicinal applications, from cytotoxicity in killing cancer cells to neuron protection in degenerative brain disorders like Parkinson’s Disease. I talked about the anti-inflammatory properties of Sinularia for treatment of arthritis in my first blog post, but that is only one of its numerous benefits to humans. I recently lost a family friend to Parkinson’s Disease. For those unfamiliar with this devastating disease, Parkinson’s affects the neurons that make up the brain, resulting in their inevitable deterioration. Early symptoms of Parkinson’s seem insignificant, like uncontrollable hand tremors, but as the disease progresses, patients lose the ability to control their muscles, resulting in stiffness, slowed movement, and, eventually, death. 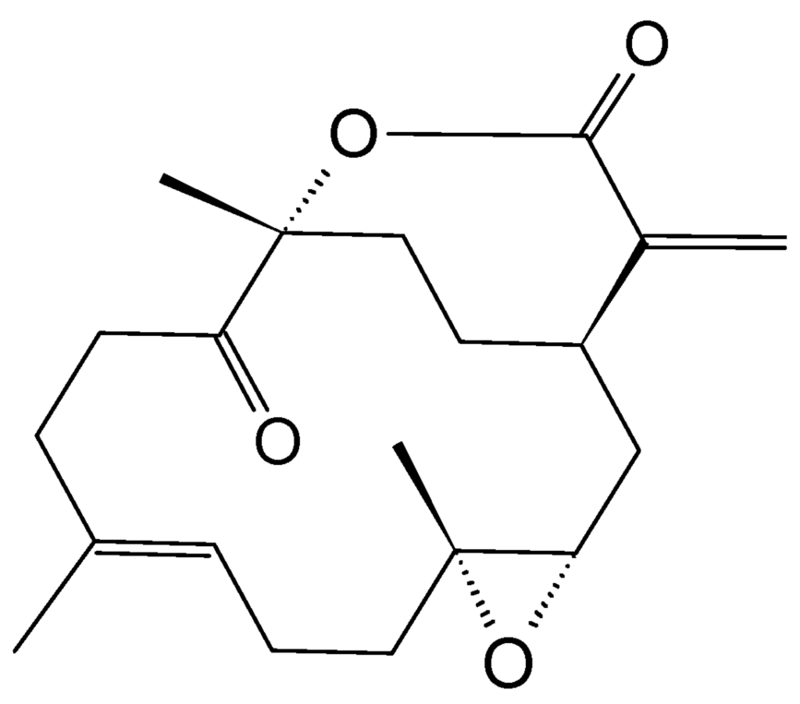 Few treatments are currently available to treat Parkinson’s; however, a group of researchers in Taiwan have isolated a molecule that has the potential to revolutionize Parkinson’s treatment.² The compound, 11-dehydrosinulariolide, was isolated from Sinularia corals and tested for its effects on human neurons (Figure 2). The results were amazing! Not only did 11-dehydrosinulariolide prevent apoptosis (cell death) of affected neurons but also decreased surrounding inflammation, which would greatly slow the progression of Parkinson’s. However, the compound is still in clinical testing, so a drug derived from the chemical won’t be available for a few more years. Along similar lines, another group of Taiwanese researchers investigated the neurologic effects from a chemical produced from the soft coral Cladiella australis.³ The compound, which they aptly named Austrasulfone, could be synthesized easily and had neural anti-inflammatory properties, so the researchers decided to test its efficacy (Figure 3). However, when they administered adequate doses of Austrasulfone to laboratory rats, they found the compound had the potential to treat a much wider array of disorders, including multiple sclerosis, atherosclerosis, and even generalized neurogenic pain. Since treatments for these disorders are very limited and results tend to be inconsistent, the development of medications that utilize Austrasulfone could revolutionize treatment for these diseases. When I tell people I’m taking a class completely devoted to coral reef ecosystems, their first question is almost always, “Why should I care about coral reefs?” For people who don’t have much of a background in biology, explaining trophic pyramids and the ecological importance of coral reefs may not be very convincing. Instead, I tell them coral reefs could one day save their life. It often puts them completely off-guard and makes them intrigued to learn more, which is when I go into all of the other important aspects of reefs. As I said in my first post, this blog functions as another, albeit less known, reason for global protection of coral reefs. So next time you get asked, “Why should I care about coral”, you’ll at least have one more tool in your arsenal to persuade with. ¹Cooper, E.L., Hirabayashi, K., Strychar, K.B., & Sammarco, P.W. (2014). Corals and Their Potential Applications to Integrative Medicine. Evidence-Based Complementary and Alternative Medicine, 2014, 1-10. ²Chen, W.F., Chakraborty, C., Sung, C.S., Feng, C.W., Jean, Y.H., Lin, Y.Y., Hung, H.C., Huang, T.Y., Huang, S.Y., Su, T.M., Sung, P.J., Sheu, J.H., & Wen, Z.H. (2012). Neuroprotection by marine-derived compound, 11-dehydrosinulariolide, in an in vitro Parkinson’s model: a promising candidate for the treatment of Parkinson’s disease. Naunyn-Schmiedebergs Arch. Pharmacol., 385, 265–275. ³Wen, Z.H., Chao, C.H., Wu, M.H., & Sheu, J.H. (2010). A neuroprotective sulfone of marine origin and the in vivo anti-inflammatory activity of an analogue. European Journal of Medicinal Chemistry, 45(12), 5998-6004. This entry was posted in Uncategorized and tagged Alex, neuron, Parkinson's Disease, pharmacology, sinularia, soft coral. Bookmark the permalink.